Created to tickle the taste buds of those who aren’t normally fond of raw cherry tomatoes, this special sun-kissed product is made by semi-drying the best cherry tomatoes. De Carol’s extra virgin olive oil helps to enhance and capture the sun, aromas and tastes of the Italy’s Puglia region. 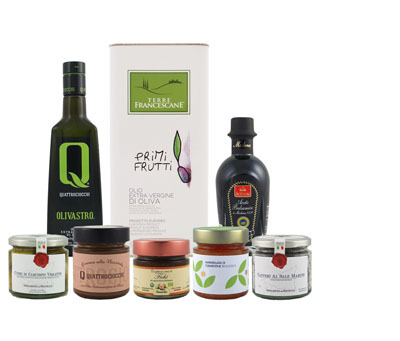 Voted by Italian consumers as a great “all-rounder” for its use in the world’s best cuisines, this versatile product is excellent on pizzas, focaccias, salads, starters, pasta and rice dishes, and with fresh cheeses such as burrata. The De Carlo family heritage of the magnificent olives cultivated in their groves can be found in the oldest documents in the archives of Bitritto that date as far back as the 16th century, Today the De Carlo family still produces prized, exclusive oil on its farm in the famous Conca Barese in the Bitritto area. In the 1980s the De Carlos decided to promote the fine quality of their oil by making it known around the world with the firm belief that the development of the company was not incompatible with the long tradition implicit in the De Carlo name. Today the family uses the most advanced technology while still preserving its traditional, artisanal origins. The new generation, who all share the same passion inherited from their parents, have developed a company policy focused on a short supply chain (most of the raw materials come from their own fields), top quality, great flavor and the very highest levels of customer satisfaction. An origin-protected blend of five unique olive varieties from Southern France.